The Snake Pit (1948) stars two-time Best Actress winner Olivia de Havilland, who turned 101 on July 1st! De Havilland is Virginia Cunningham, an aspiring writer and newlywed. Early in their marriage, she begins to wonder about her husband’s love for her. She becomes confused and disorientated, necessitating her commitment to a state mental institution. Her experiences in the institution are harrowing. The movie had such an impact on the public that many states reevaluated and changed their treatment of mental patients. De Havilland heads an impressive cast that also includes Leo Genn as a sympathetic psychiatrist and Mark Stevens as her long-suffering husband. 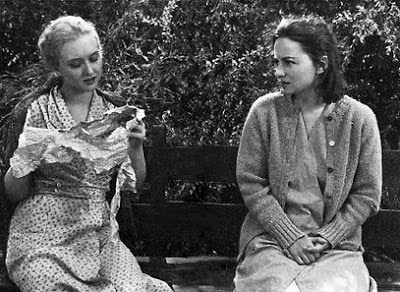 The cast is populated by some of the best-known character actresses of the era, including Beulah Bondi, Ruth Donnelly, and Natalie Schafer. 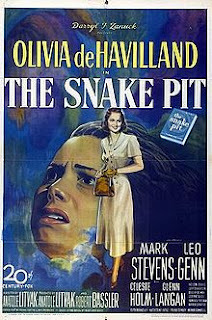 The Snake Pit was nominated for six Academy Awards, including Best Picture, Best Actress (de Havilland), and Best Director (Anatole Litvak). The movie is based on the semi-autobiographical novel of the same name by Mary Jane Ward. Ward had a nervous breakdown and spent eight months at Rockland State Hospital in Orangeburg, New York. During her care, she was subjected to scalding baths and electroshock therapy, similar to what the Virginia Cunningham character experiences in the film. Director Litvak made sure that all the character actresses in the film were seasoned professionals. He wanted to make sure that they could stand up to a talent like de Havilland. There are dozens of recognizable faces in The Snake Pit, making it a classic movie buff’s delight. This is part of the “Classic Movie Man Favorites” series.